One of the threads running through The Savages is Jon Savage's obsession with Bertolt Brecht and his longstanding inability to complete a book about the famed German playwright. At the end of the story, Jon is off to Poland to present a paper titled, "What's So Funny? : Finding the Dark Humor in the works of Bertolt Brecht." (Or something to that effect...) As difficult as task as that might be, writer/director Tamara Jenkins has taken on a similar assignment--finding the dark humor in dementia and dysfunctionality. Through the talented portrayals of Philip Seymour Hoffman and Laura Linney as Jon and Wendy Savage, she comes closes to accomplishing her goal. At times dark, bleak, sad, poignant and on occasion, humorous in a twisted way, The Savages deals with the struggles of two siblings--stagnated in both their personal and professional lives--when they are forced to deal with taking care of their absentee father. Although the film offers a grim yet realistic picture of the wrenching decisions necessary when dealing with an aging parent, it is really about the old axiom about growing old vs. growing up. Jenkins explores the paradox where age doesn't always equal wisdom or maturity. Jon and Wendy epitomize the immature, self-absorbed, neurotic behavior of emotionally stunted people--but then again, so does their elderly father. she sets up the theme that no matter how old we get, we're still all fragile children inside. 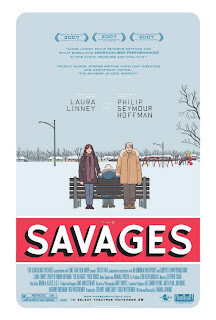 The Savages does indeed have its moments--and Hoffman and Linney give their usual Oscar caliber performances--but given that for many of us 'tis the season of dysfunctionality upon us now, you might want to wait for the post-holiday blues to wallow in depressing fare. Or maybe not. It's not like holiday staple It's a Wonderful Life is all sugarplums and candy canes now, is it?